From the first line of Change your Schedule, Change Your Life I was hooked. The foundation of my healthy lifestyle has long been the Ayurvedic practice of good dinacharya (daily routine), and this book highlights importance of the following the Ayurvedic clock in a way that is practical and easy to digest. Ayurveda science has long known that the body has a natural rhythm. According to Ayurveda, to live a balanced healthy life we must align our sleep, work, meals and even exercise schedules to the body’s internal clock. Scientists today also recognize the importance of the body’s natural rhythm—called circadian rhythm. Our bodies operate on a 24hr cycle that resets itself every morning when the sunrises. This rhythm regulates digestion, sleep, blood pressure, temperature, hormone production and cellular repair. According to Ayurveda, the stress of living against these natural cycles results in many of today’s health problems including, insomnia, low energy, anxiety, weight gain and depression. Ayurveda breaks the day into six, four-hour cycles—each cycle has qualities of one of the three doshas and is linked to certain functions governed by that Dosha: Vata (air), which controls the nervous system, pitta (fire), which controls digestion and metabolism, and kapha (earth and water), which controls immunity and strength. Understanding how to connect your daily routine to these cycles is a powerful tool for vibrant living. Kapha is the energy of stability and is slow, steady, heavy and deeply rooted in the body. Kapha energy accompanies sunrise and provides us with stability as we enter a new day. You may notice the longer you sleep the harder it is to wake up. That’s why Ayurveda recommends waking up just before or at sunrise. Morning is a great time for exercise, pranayama (directed breathing) and meditation. Kapha energy is cool and slow therefore our digestion is not as strong in the morning and evening as it is mid-day. Aim for a light to moderate breakfast around 7am. The kapha time of morning is a great time for checking things off your list including crucial but simple tasks. Pitta is the energy of transformation, associated with the fire element and governs our ability to metabolize food, information and emotions. During this time of day our minds and digestion are at their peak. Ayurveda recommends eating your biggest meal mid-day around 1pm when agni (digestive fire) is strongest. Also this is the best time of day for problem-solving, strategizing, doing analysis and for processing emotions. Vata is the energy of movement and is related to the air and space elements. Ever wonder why you feel antsy around 3pm, lose your focus and crave a snack, even if you aren’t hungry? That’s vata energy wanting to move. Creative energy is at its highest during this time of day but we can also feel fatigue. Make sure you are hydrated in the afternoon and if you experience afternoon cravings focus on eating a bigger mid-day meal. If you have a lot of creative thoughts this time of day write them down and make a list to tackle the next day. In the evening we return to the slow, steady and stable energy of Kapha dosha. This is a time to eat an earlier and lighter dinner (by 7pm), connect with family, unwind and tune into the body’s signals for sleep. Aim for a 10pm bedtime. At about 10 p.m., fiery pitta takes over from drowsy kapha. During this time the body renews and repairs itself while digesting experiences, emotions, and any remaining food from earlier in the day. Because pitta is fiery and hot, if you fight through the drowsiness of kapha time and stay up too late, you’ll catch a second wind that can keep you up to all hours— leaving you at an energy deficit the next day. Ever find yourself wide awake at 3 or 4 am with your mind running and you can’t shut it off? That’s vata on the move again. This is a time when dreams are vivid and when the body is preparing for early morning elimination. It’s also a time when we are most connected to our subtle bodies and spirit, therefore its a great time for meditation. The most important thing to remember is to wake up just before Kapha time so that the light, energetic qualities of Vata move us into our day. 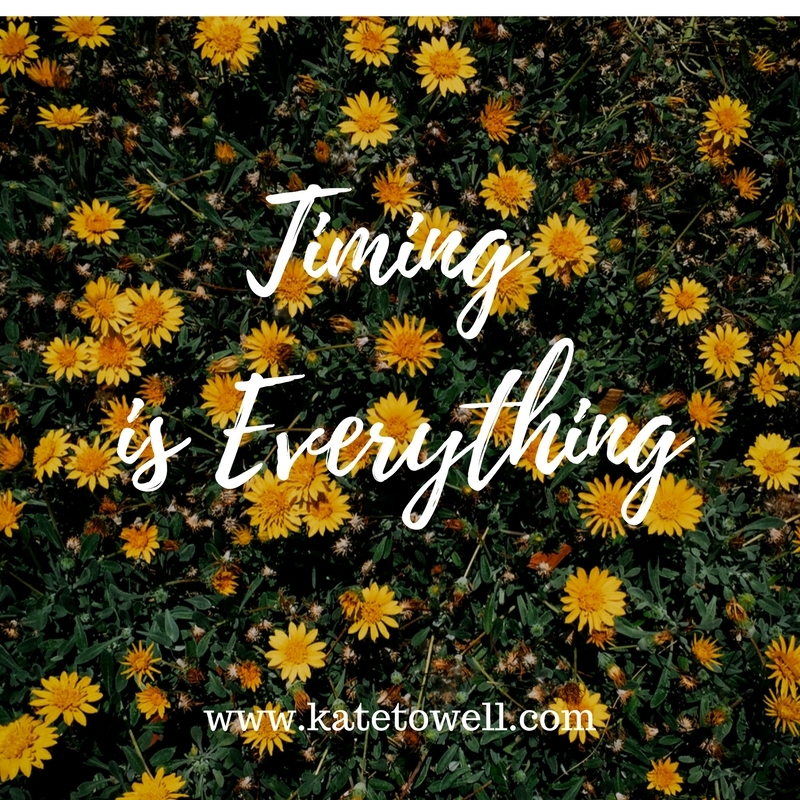 Aligning our hectic modern-day lives to the Ayurvedic clock can prove challenging but making the effort has lasting positive effects on our health and wellbeing. 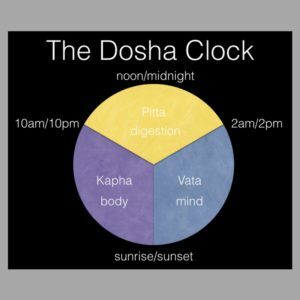 Scheduling our mealtimes, wake/sleep cycle, and general activities to the cycle of doshas will help restore that balance—and create vibrant living.